Pomegranates are extremely healthy and can be used in savory and sweet dishes. 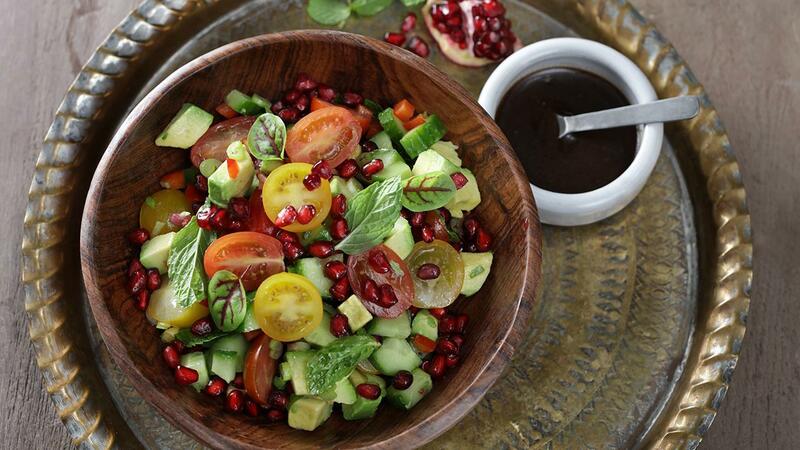 For this salad, we used wholegrain mustard to emulsify the dressing and to give this recipe a perfect balance between the sweet of the pomegranate and sour of the vinegar. The key to healthy dishes in Ramadan is variety of colour for fruits and vegetables. Toss all ingredients together with Knorr Lime Seasoning Powder in a bowl and set aside. Blend all ingredients together and transfer to a squeeze bottle. Dress the salad in a bowl and transfer to your plate, garnish with the leaves and the seeds.